Indigenous Commitment | Willows Construction (2001) Ltd.
Willows Construction (2001) Ltd. is committed to establishing meaningful, mutually beneficial relationships with First Nations and Métis people. We will respect First Nations and Métis communities and their way of life. To achieve this, Willows Construction (2001) Ltd. will strive to learn from First Nations and Métis Communities. We are committed to working with First Nations and Métis people, their communities, respective businesses and providing meaningful employment opportunities; supported through training, mentoring and apprenticeship programs. Willows Construction (2001) Ltd. is committed to building and enhancing our relationships with First Nations and Métis people through engagement. We will achieve this with open and ongoing communication, consultation and collaboration with First Nations and Métis people in the areas in which we operate. We believe in supporting and encouraging businesses in the communities where we work and giving them the opportunity to provide goods and services to projects Willows Construction (2001) Ltd. is a part of. Our company employs qualified Indigenous people willing and able to participate in our corporate safety program. Every effort will be made to provide long term, stable employment to these individuals. Willows Construction (2001) Ltd. has a proven track record of providing opportunities to Indigenous businesses and organizations. This includes sharing and assisting, if required, with procurement development, job training and education that improve economic opportunities, and the well-being of individuals and businesses. To achieve this, Willows Construction (2001) Ltd. promotes forming business relations with Indigenous companies. Before project commencement, we meet with Indigenous organizations to discuss available services and manpower requirements and determine how Indigenous businesses and individuals can participate. This approach increases opportunities for all involved. 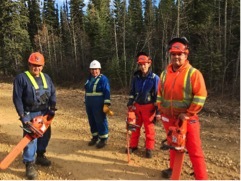 When Willows Construction (2001) Ltd. is awarded a contract, we contract the available manpower and services provided by our Indigenous partners. By demonstrating our commitment to hire and provide opportunities to our Indigenous partners, we ask that our Indigenous partners offer Willows Construction (2001) Ltd. an opportunity to participate in projects awarded to or initiated by them. By hiring local service providers, Willows Construction (2001) Ltd. is able to provide competitively priced construction services to our customers and economic and social benefits to our partners.